IDT Offers Updated Open Standard Solution for Sensors and IoT Applications | Integrated Device Technology, Inc.
SAN JOSE, Calif., July 10, 2018 /PRNewswire/ -- Integrated Device Technology, Inc. (IDT) (NASDAQ: IDTI) announced today its commitment to further expand IDT® sensor solutions into the IoT marketplace by releasing the latest SensorShare™ software platform, which enables networked sensors and simplifies the use of cloud data analytics. The new SensorShare software platform offers several new tools which support sensor deployments via cloud service providers. IDT has preconfigured, and added provisioning features, to connect networked sensor solutions to its recently released SDAWIR0x wireless sensor hub evaluation kit. The latest release of IDT's ZWIR45xx 6LoWPAN module, featured in the evaluation kit, comes with this new firmware as a standard offering, without a license fee and royalty-free. It offers a compelling alternative to LoRa- and Zigbee-based solutions available in the market today. IDT is currently partnered with select customers for key applications such as street lighting and home automation. IDT's partners have selected the ZWIR45xx due to IDT's license-free sub-GHz 6LoWPAN protocol, mesh-enablement, low power, and range capability. By simplifying sensor system deployment and management, customers who leverage the SensorShare software platform are able to free up resources and expertise to focus on value-add application integration and software development. Customers can effortlessly retrieve real-time sensor data to use in a local network, even with intermittent or no internet connection. Data is readily pushed into the cloud for storage and data analytics enabling quick product deployment via the cloud. 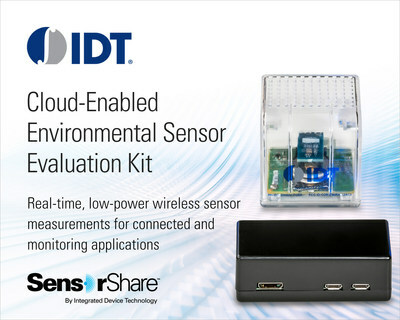 IDT's SDAWIR0x wireless sensor hub evaluation kit also allows product designers and engineers to validate the advantages of IDT's high-performance humidity, temperature, gas, and flow sensors in industrial IoT, connected home, and environmental applications. The kit also features Over-The-Air (OTA) firmware update capabilities to simplify development and system updates after deployment. "IDT has paved the way to the next frontier of data accessibility enabling Sensing as a Service. SensorShare software platform integrates instantly and seamlessly into even complex cloud-based data acquisition infrastructures so that our customers stay focused on their goals and objectives," said Sailesh Chittipeddi, IDT's Executive Vice President for Global Operations and Chief Technology Officer. IDT's SDAWIR01 and SDAWIR02 wireless sensor hub evaluation kits are available today worldwide. Visit https://www.idt.com/products/interface-connectivity/ipv6-modules/sdawir-wireless-flow-rate-humidity-and-temperature-sensing-evaluation-kit to learn more and place orders, or contact your local IDT sales representative. Integrated Device Technology, Inc. develops system-level solutions that optimize its customers' applications. IDT's market-leading products in RF, high performance timing, memory interface, real-time interconnect, optical interconnect, wireless power and smart sensors are among the company's broad array of complete mixed-signal solutions for the communications, computing, consumer, automotive and industrial segments. Headquartered in San Jose, Calif., IDT has design, manufacturing, sales facilities and distribution partners throughout the world. IDT stock is traded on the NASDAQ Global Select Stock Market® under the symbol "IDTI." Additional information about IDT can be found at www.IDT.com. Follow IDT on Facebook, LinkedIn, Twitter, and YouTube. © 2018, Integrated Device Technology, Inc. SensorShare, IDT and the IDT logo are trademarks or registered trademarks of Integrated Device Technology, Inc., and its worldwide subsidiaries. All other brands, product names and marks are or may be trademarks or registered trademarks used to identify products or services of their respective owners.